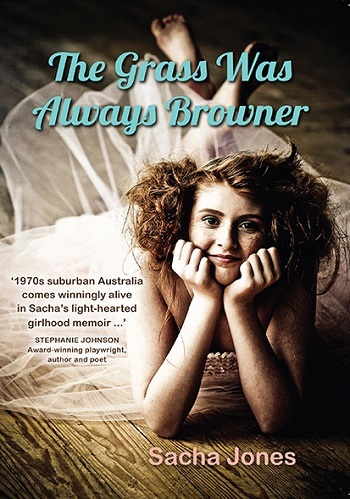 The Grass Was Always Browner by Sacha Jones is the story of a strong-willed, smart yet often less than sensible, curious and questioning girl growing up as the middle-child of three children. Her parents are old, and old-fashioned, deeply impractical, idealistic and naive, not best suited to negotiating the rough and rugged terrain of suburban Sydney in the 1970s-80s. Sacha is not only the middle child, but she is stuck in the middle of the muddle and mess of her family’s situation. She sees and suffers more than her siblings do – or so she feels. However, one advantage of her position is that she is sent to study ballet to treat her asthma, and through ballet she finds a way out of her predicament. Sacha’s determination to escape her humdrum existence and ‘become Russian’ saw her push through and succeed against the odds (wrong-shaped head, wrong feet, overall wrong build) and a father who is strongly against her becoming a ballet dancer. He describes ballet as ‘a frivolous and selfish pursuit, too focused on appearances.’ His own dreams are focused on a desire to save the Third World. However, in their very different ways, Sacha and her father are more alike than either would care to admit. In becoming a dancing star, Sacha surprises no-one more than her legendary dance teacher– an actual Russian – Mrs P, Tanya Pearson. However, her father was right about ballet. Although it gives Sacha the escape she desires, there is a heavy price to pay. And when she sets off for London to further her dance career, it is in part because the Australian dance scene betrayed her trust. The Grass Was Always Browner is a laugh-out-loud memoir and a cautionary reminder that the grass is not always greener on the other side of the fence. This book left me struggling with how to write my review. It was definitely different from memoirs I have read before. Sacha was a very unique person to read about. Experiencing her life's memories through her eyes was a very interesting journey. The ups and downs, her very bizarre, but quite humorous family, and her unique way of telling her story combined to make a nice read. The book was longer than I had expected it to be, but as a life's journey, it definitely ended up being appropriate. I also had a few jumbled moments where it took me a moment to figure out what was going on. Overall, I liked going through Ms. Jones’s life and I would recommend this book to fans of memoirs looking for something different. 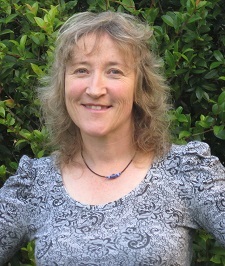 Sacha Jones has a PhD in Political Theory from the University of Auckland and has variously taught politics, preschool and dancing. She lives with her family on the outskirts of a proper forest (in Auckland, New Zealand) and returns as often as it will have her to the land of fake forests and improbable fruits where she grew up (Frenchs Forest, Sydney). Follow The Grass Was Always Browner Blog Tour HERE. Reviewers on the Wicked Reads Review Team were provided a free copy of The Grass Was Always Browner by Sacha Jones to read and review for this tour. Thank you for reviewing and hosting THE GRASS WAS ALWAYS BROWNER today!